Mr. Rubenstein has been helping clients throughout Southern Ohio to contest their criminal and DUI charges and has obtained superior results for many years. He promises 100% confidentiality. As a skilled criminal defense attorney, he is fully prepared to undertake your or your loved one’s case today. When he works with his clients, he does everything possible to make sure that they receive the attention, resources, and dedicated legal counsel that they deserve. 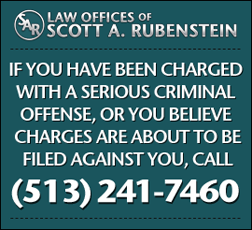 If you have been charged with a serious criminal offense, call The Law Offices of Scott A. Rubenstein at (513) 241-7460 or use the online contact form below. We are available 24/7 and can evaluate your case and advise you of all your legal options. (513) 241-7460 or by using the online contact form here.